As a cold and snowy winter finally gives way to spring, the promise of bright, warm days is near. One item in the Amtrak Archives that always conjures up images of fun in the sun is this 1976 menu used on the Coast Starlight. According to its pages, passengers could enjoy a variety of entrees and snacks, from chilled cottage cheese with fruit to spaghetti and meatballs. 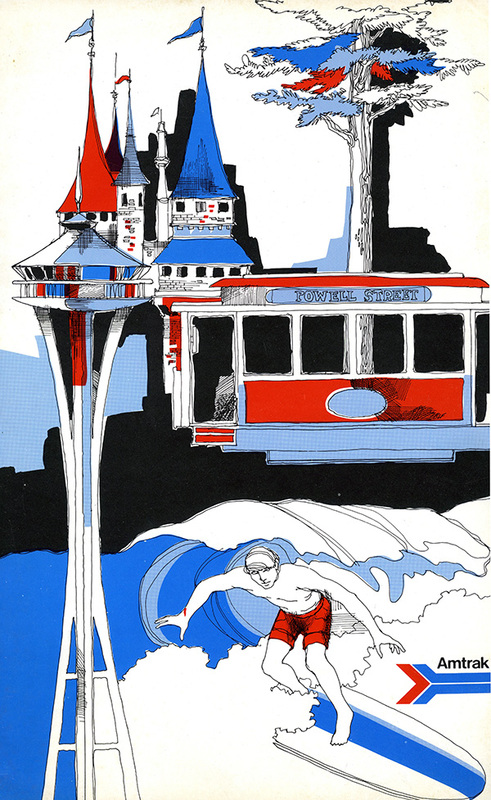 The cover includes landmarks and scenes along the route between Seattle and Los Angeles, such as the Space Needle, a northern California redwood tree and a surfer catching a wave. On closer examination, he appears about ready to launch off the page and into the dining car. You might very well spot surfers as the Coast Starlight, always ranked one of North America’s most scenic trains, hugs the stunning Southern California coastline between Oxnard and San Luis Obispo. Sleeping car passengers can admire the scene from the refurbished Pacific Parlour cars, which were originally built by the Budd Company for the Atchison, Topeka and Santa Fe Railway (Budd would build the Amfleet cars for Amtrak in the mid-1970s and early 1980s). The Pacific Surfliner hugs the coast near Del Mar, Calif. The Pacific Parlour cars were configured as lounges for use on the Santa Fe’s El Capitan, an all-coach train running between Los Angeles and Chicago. Cars used on the train were known as Hi-Levels, denoting that they had two levels. When Amtrak put out the bid to design and produce the bi-level Superliner equipment in the 1970s, the Santa Fe Hi-Levels were used as a model due to their popularity. Amtrak refurbished the Pacific Parlour cars in the mid-1990s to provide a casual, yet elegant, space for Coast Starlight sleeping car passengers to relax. Trestles close to the San Clemente Pier station. The last takes its name from a series of railroad bridges that cross over wetlands in San Onofre State Beach, which borders Camp Pendleton on the south end of San Clemente. The popularity of surfing in the area goes back half a century, and San Clemente is now a hub for numerous surfing-related publications, workshops and competitions. Have you used the Coast Starlight or Pacific Surfliner to hit the waves? Tell us about your favorite Amtrak-accessible surf spots (unless they’re a secret!) in the comments section below.